HOLLY FITZGERALD was born in Seattle, Washington, and grew up in New Haven, Connecticut. She graduated from Lake Erie College and received a master's degree in counseling from Suffolk University. FitzGerald worked as a counselor with children and adults for many years before teaching and counseling at Bristol Community College, New Bedford, Massachusetts. She lives in South Dartmouth, Massachusetts. "The 'survival' tale has long occupied a storied corner of the travel writing genre, from The Worst Journey in the World to In the Heart of the Sea. 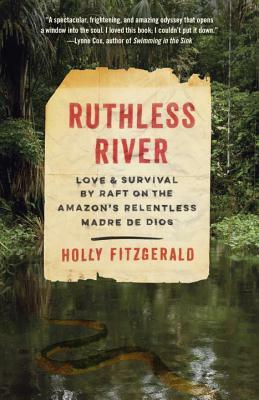 Holly FitzGerald's Ruthless River instantly takes its spot among these giants ... In this world of water, the FitzGeralds struggle in vain to find their way back to the river's current ... The couple endures, maintaining hope and affection for each other. It's this that elevates Ruthless River above the typically heroic tale of survival. In simple, unsentimental terms, Holly FitzGerald has given us a most unlikely love story." “If you built a survival-adventure book in a laboratory, you’d end up with Ruthless River . . . A completely unexpected real-life thriller.